In the previous lesson on how to draw race cars, you began your initial sketch after learning about vanishing points and perspective and how to break the car down into a series of simple shapes. Now, using your reference photos as a guide, you’re going to continue adding more detail in preparation for your lineart. So, if you’re ready, fasten your seatbelts and let’s take a drive! 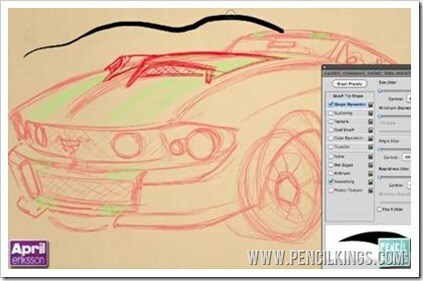 By this stage, you should already have the basic shape of the car drawn out. Now, it’s time to keep adding details and creating a blueprint for when you start laying in some clean lineart. 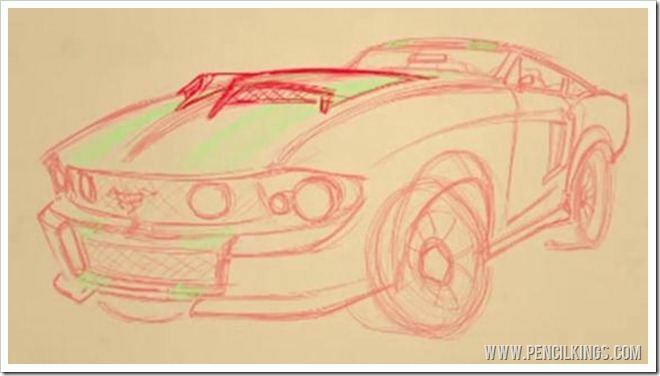 The first part of this video on how to draw race cars is in time lapse, so you can quickly see how April adds elements such as the wheels, headlights and grill to complete here initial sketch. You can do the same, remembering to checking your reference photos regularly so that everything looks right. When you come to drawing the raised part of the hood, you might find it useful to create a new layer and drop the opacity of the one beneath. This way, you can add in more detail without getting too confused. By the time you’ve finished with this lesson on how to draw race cars, you should end up with something like the example above. It may look a little sketchy, but that’s all about to change as we go in and start adding some clean lines. When learning how to draw race cars, there are several ways in which you can clean up your drawing and create a precise lineart layer. If you have a tablet and prefer to draw freehand, you need to adjust your Brush Settings to Pen Pressure to draw lines which get thicker as you press harder. This method is really useful if you want to draw organic, curvy lines and is used a lot by leading character artists also featured on Pencil Kings, such as Sycra Yasin and Giovanni Kososki. It helps create lines which are full of life and can really make a drawing or painting stand out. 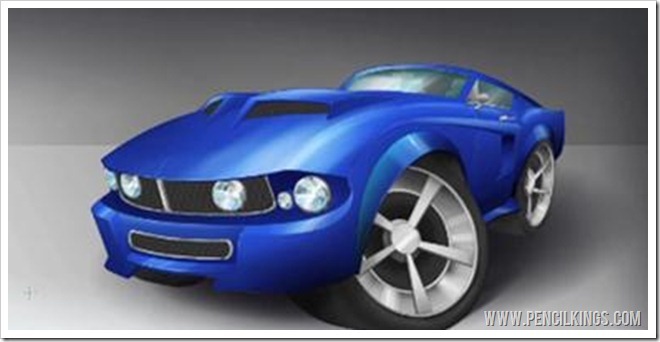 However, if you’re drawing a vehicle such as the 1967 Mustang in this lesson, you might prefer to use the Pen Tool instead for super precise lines and exact curves. If you’re new to the Pen Tool, it can take a little while to get used to. However, once you’ve mastered it, you’ll find this method is really useful for creating the sleek curves and precise angles of a motor vehicle. In the next lesson on how to draw race cars, you’ll learn how to use this feature to create crisp, clean lineart that will form a great basis for your fully-rendered painting. We hope you’ve learned a lot already and that you’re now ready to start getting precise with your lineart layer. Any questions? Leave a comment in the box below and we’ll get straight back to you!